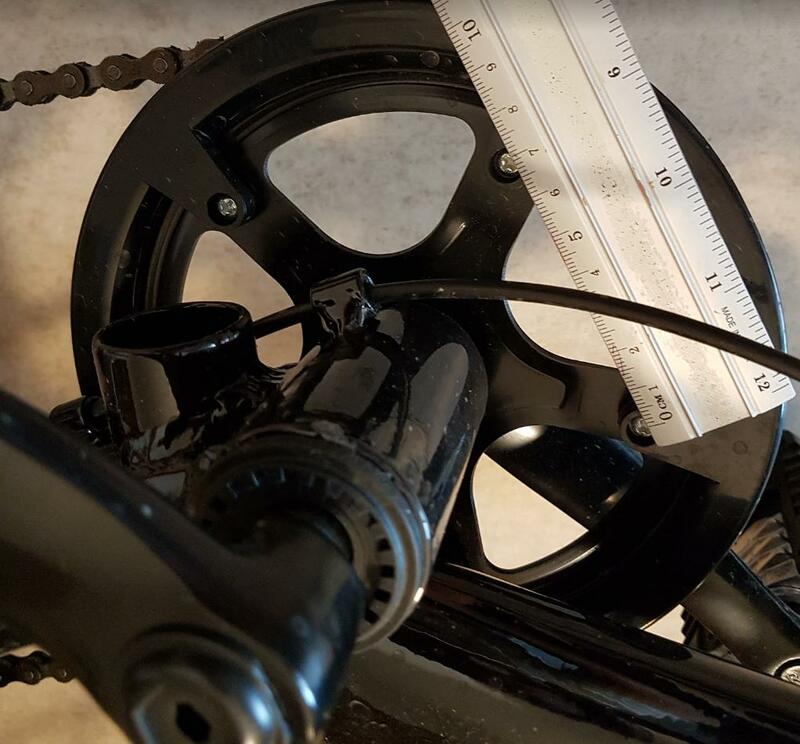 I have a 20" bike with a single 42T chainring and a 6-speed sprocket. The top speed is pretty low (I'm used to racing bikes), calculated to be ~24kph @90 RPM. I've measured the 5-arm distance between mounting bolts and it seems to be 68-69mm. This looks like a 120mm BCD, but not sure on that. I can't seem to find manufacturer data, except Cyclone SP5. I think I need a 52 or 53T chainring, how should I search for one? What would be the cheapest option, given that the bike is practically new but with low-end components? I did exactly this with my cheap $50 folder. The purpose was to expand the useful gear range, to get more hill-climbing gears and more top-end gears. 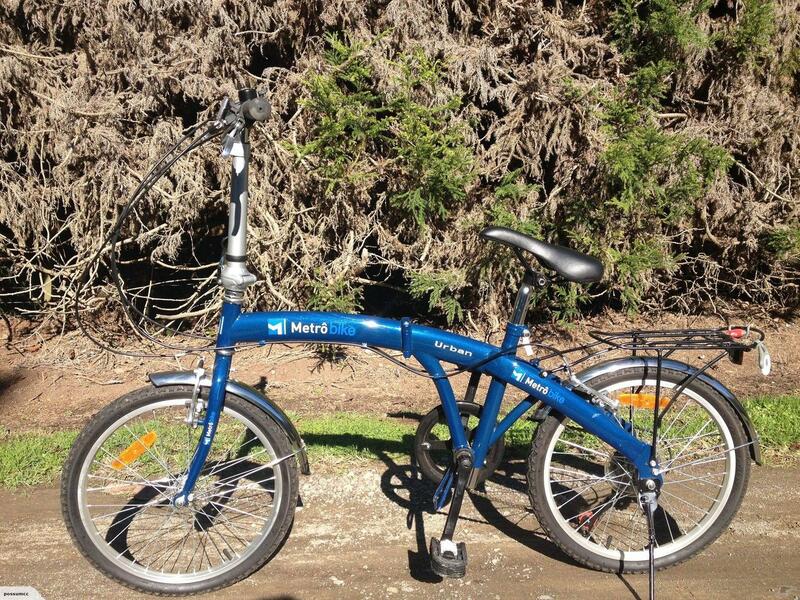 Its still not a speed demon, but it can do 40 km/h with a tail wind. Normal cruising speed is 25-30 km/h depending on wind and load and freshness, so slower than the road bike but faster than it was. 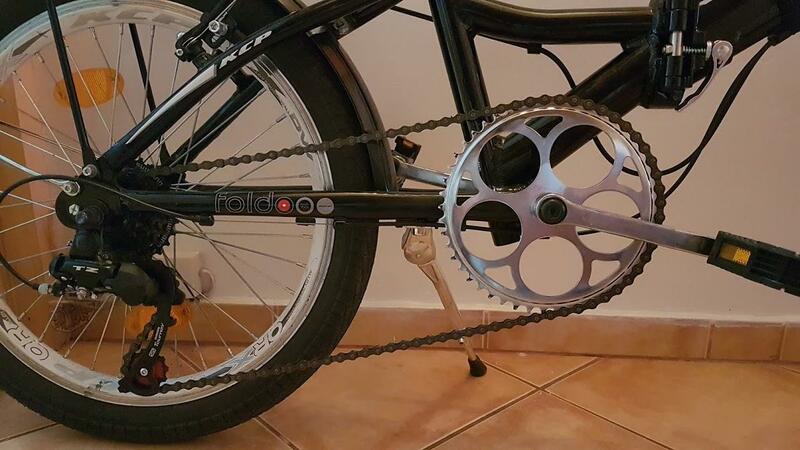 It started as something similar to yours, with a 1x6 setup consisting of a single ~42 tooth chainring and a 14-28 freewheel. Had to use a grinder to get the freewheel off being cheap chinese junk. It now looks more like this with a 3x8 setup. The rear wheel was rebuilt onto a 8 speed freehub and I fitted am 11-32 cassette. Shifter needed replacing too, but the cable and chain was left as-is. The front chainring was replaced with a triple that I had laying about, so its 26/36/48 tooth. I did NOT change the bottom bracket at all other than a quick inspection, clean and grease. All up this gives a lowest gearing of 15 gear-inches, and a maximum of 80 gear inches. I did not change the rear derailleur mechanism. Downsides I've never found a front derailleur mech that fits, so for now its running as a "norailleur" and the front chainring is selected by hand, or using a scrap of cardboard for cleanliness. I have twice changed down while ascending a slope without stopping, using a screwdriver! Other comments Cheap plastic folding pedals are dreadful. As a racer you're likely to put down more power than a simple rider. Refer to this question and note in the pics I swapped out for some short normal pedals. The bike gets very dirty too, even with full mudguards as pictured. I think its because the chain ends up so close to the ground. Or because it has full guards, this is the one I ride in the rain. Because of the available low gearing, I use this as the tractor for my bike trailer, which works quite well. The folding mech clamps are tuned by two grub screws. Get these exactly right and use loctite to hold them in place. Else the two clamps develop play, which is a horrible feeling while riding. Finally - I tend to accelerate this out of the saddle, pushing the bars to raise the opposite pedal. Almost BMX styles. However it flexes something chronic so I periodically inspect up close. It gets stiffer if I ride with the seatpost way down (like top picture) vs up at "road bike" height for me. As an update, I found an independent bike mechanic in a tourist area and he replaced the entire chainring assembly, including the crank arms. I don't know what the donor bike was, but I now have a 48T chainring instead of the old 42T one. The effect is like gaining an extra gear, so I can cruise now with around 24 kph instead of 18 or so. The chain was left unmodified. The ground clearance is a bit worse now, requiring extra care as to not dent or chip the chainring. Total cost was ~10 USD, including work, which is why I chose this solution. Not the answer you're looking for? 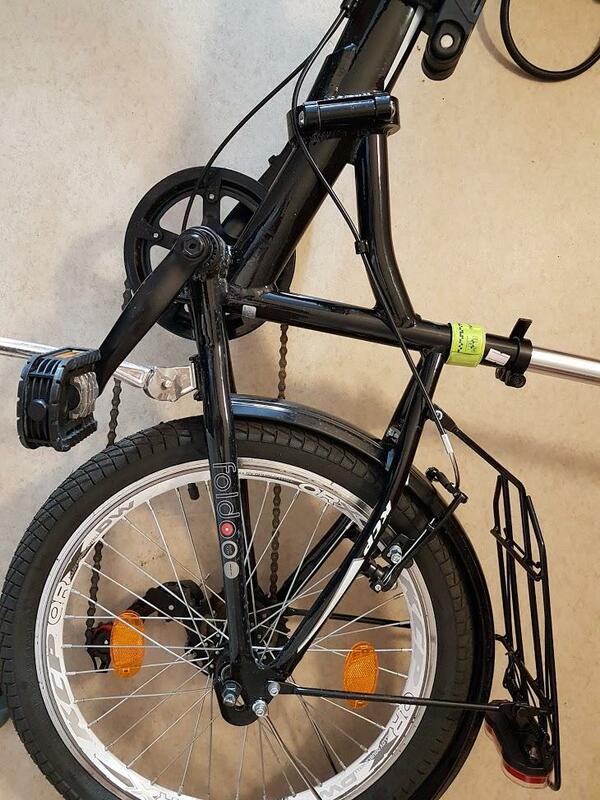 Browse other questions tagged chainring folding-bicycle or ask your own question. Are all folding pedals a bit… bendy? 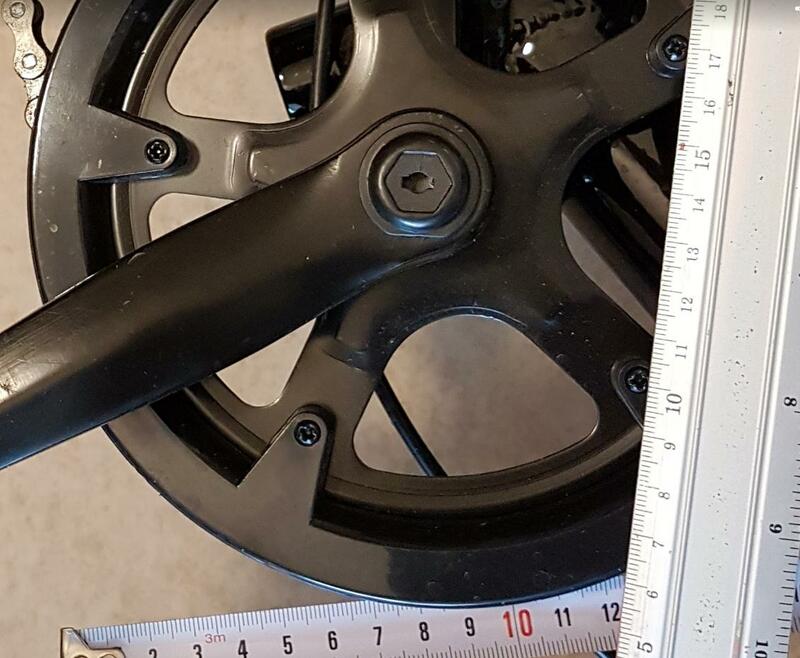 Good source for folding Strida clones? 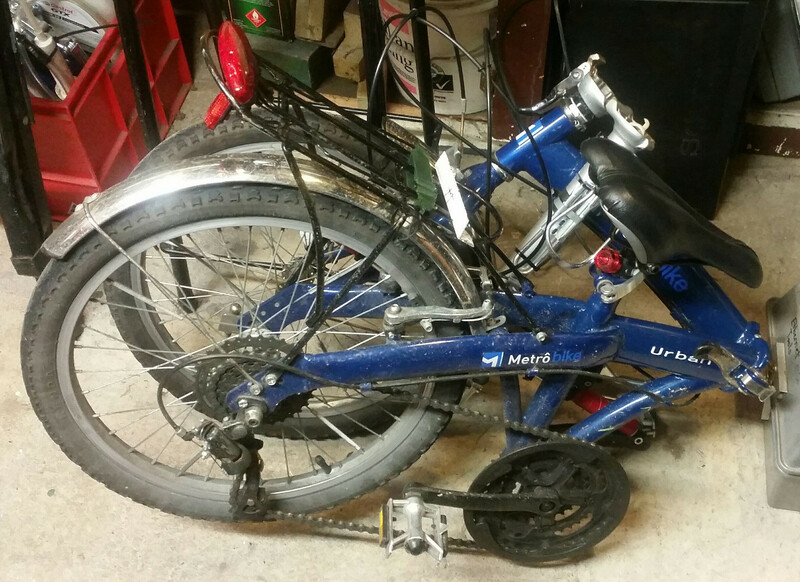 Why are folding bike warranties so short?